Hopefully yours, Connie: Infertility and the Holidays: A "Double Dose of Hectic"
December holidays are busy for almost everyone, and those of us who grapple with infertility feel especially challenged at this time of the year. Those challenges are both practical and psychological. So let's see what we can do so as not to become overwhelmed by the "double dose of hectic." In terms of practical challenges, not only do we face the expectable tightness of our schedules as we shop for presents, wrap gifts, send out cards and holiday letters, attend (or host) various parties and events, bake special goodies and decorate our home for the holidays. In addition to the usual holiday tasks, our infertility may place unique pressures on us at this time of the year. Is our doctor's office going to be open around the clock during the holidays? If not, does that mean missing treatments, being delayed in hearing lab results, or needing to be seen by unfamiliar medical personnel as the clinic copes with absences of key staff during the holidays? If your physician also sees women without infertility concerns, does this mean infants, children and pregnant women in the waiting room, many of them dressed in holiday garb and reminding you of what you'll be missing this year -- sharing the holiday excitement with a wide-eyed child? Perhaps you have the opportunity to be out of town during the holiday period. Does this mean that you need to schedule blood tests in a distant location, feeling all the while that there's no escaping your infertility? Or maybe the costs of infertility are becoming especially apparent at this time of the year, when you have less to spend on holiday celebrations? These practical challenges are aggravating for some of us and downright depressing for others. At a time when we have so little control over the one thing that matters so much -- our dream of becoming a parent -- it especially hurts to have additional losses of control because of unexpected schedule juggling during the holidays. So what can you do? One thing to consider is to scale down on your expectations for yourself in terms of your productivity or activities related to the holidays. This is probably good advice for anyone at this time of the year, but if you feel extra pressure from infertility concerns, then for sure you need to reduce your stress wherever you can. Think about what could be dropped from your "to do" list; enlist your partner or friends to do tasks that can be shared; hire some help; alert family and friends that you're striving for a restful holiday this year. Next, in the spirit of being restful, think about how you can psychologically take some time out from holiday pressure. A good book? a funny DVD? some time on the treadmill? tea or eggnog with a few close friends? a nap? Undoubtedly you can think of what works for you -- and your challenge then becomes putting yourself first at a time of the year when it is easy to get caught up meeting others' expectations. Just remember, you're experiencing the "double dose of hectic," so you, especially, are entitled to take some quiet time to regain your perspective. Now, remembering that I also mentioned the psychological challenges of this time of the year, let's see what that might mean for you. Since several of the December holidays have a major focus on children, there's no escaping their excited presence -- whether enjoying school vacations, playing in the snow, sitting on Santa's lap at the mall, or being wheeled everywhere in carriages and strollers. This, often combined with harried parents' complaints, can set our teeth on edge. It is such an emotional reminder that we don't yet have a child and, when and if we do, that we will be accepting, not resentful, of the inevitable stress of parenthood. So, whether you encounter the excited children head on when you venture out to malls and restaurants, or whether you consciously choose to avoid those locations as much as possible over the holidays, be purposeful about how many doses of childhood excitement you can psychologically absorb. When you are reaching your limit, try to find a quiet place to regroup, consider postponing your tasks for another day, and head for a peaceful place where you can focus on more calm thoughts. But what if leaving the scene isn't an option? Here I am thinking of family gatherings, holiday meals, and traditions where your presence is expected. Here is where some anticipatory planning can provide a safety net. You and your partner are probably aware of what is likely to occur at these various family events and how those occurrences may push your buttons. Make a plan, and clue your host in, that if it all begins to feel "too much," you will retire to a quiet bedroom, or for a short (or not so short) drive, or excuse yourself with a headache (yes, I know it's really a heartache...), and head for home, or your hotel room, or a peaceful place you've identified in advance as emotionally safe. Once there pull out a book, listen to music, light a fire in the fireplace, meditate, or do whatever you can to feel more calm and relaxed. Holidays are a mixed blessing, and infertility makes them even more mixed, as holidays often mark another year that has passed without a baby. 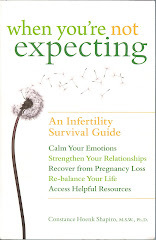 You are entitled to feel the sadness that accompanies these yearnings, and you also are entitled to make whatever conscious efforts you can to soften the impact of your infertility at an emotionally vulnerable time in the calendar year. Even as you are feeing vulnerable, remember that you also are loved and that your loved ones deserve the opportunity to support you through this season. Clue them in. Let them help.